Trek master Nori had driven us through the night to get to Mt. Fuji, the famous active volcano. 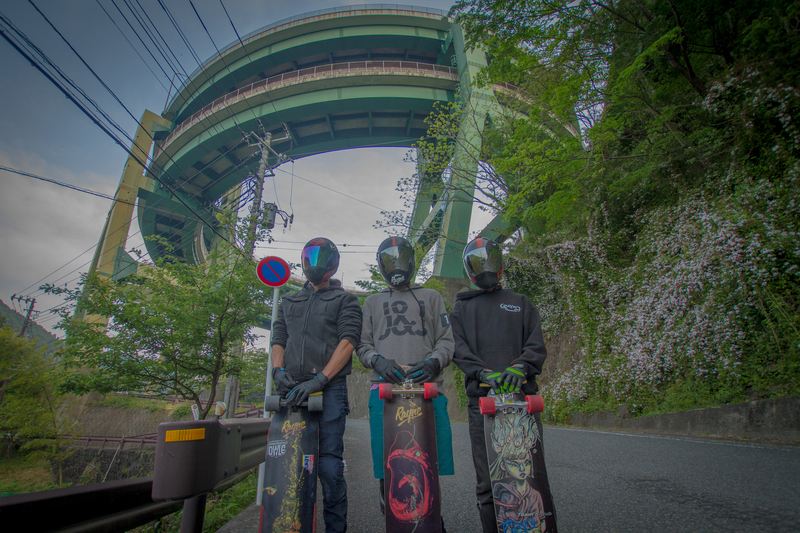 The main passes were all bad pavement and not very steep so we seeked out what’s probably the most famous spot in Japan, “Seven Stitches,” the road Matt K rides in his SkateHouseMedia video. We quickly agreed that this was one of the best spots of the trip. It’s just one of those really fun roads. Just really flowy, great pavement, and endless corners. 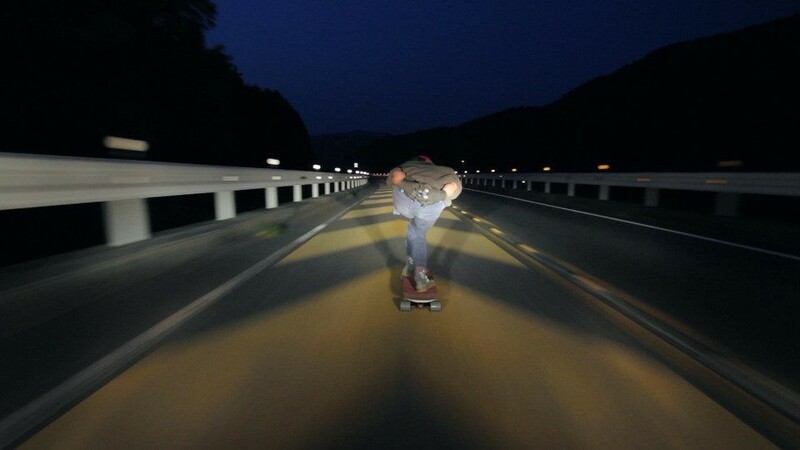 The funnest way to skate it was to cruise and do small stand up checks in the bends, still keeping your speed. Radios were necessary because it’s narrow and super blind. Midway through our session, 3 local skaters showed up. One of them in particular was shredding and to our surprise, he’s 41 years old! Yoshi Souma rides for Moonshine and was blasting fast stand up slides right with us. Check out Clayton’s raw run of the better section of this road. Our trip was nearing a close, but we still had one more spot on the agenda, and it was a doozie… I’d scoped this thing out online months before the trip and wasn’t sure if it was doable. A loop bridge on a highway that turns right for 720 degrees and drops 150ft! It looked good to go but traffic was super busy on this main artery so we camped on the side of the road and set our alarms for 3:30am. Any other time and we’d have to deal with semi trucks, slow moving cars, and tons of oncoming traffic. This was a get-in, get-out operation. When I awoke at 3:30am, the first thing I noticed was traffic coming down the highway. Even at this hour there was a car every 30 seconds or so. Good thing we got up early! We had a super quick coffee, put the camera on the hood, and rolled to the drop in point. It was now 4am and still almost pitch black. Being the most experienced downhiller, I volunteered for first run. Knowing we might only get one, I had to hit it hard and fast to get the shot. Clayton flicks on the headlights, starts the camera, and off we went. I’d memorized the map so even though I could only see 40ft ahead, I knew what was coming. A few corners were sharper than I expected though for sure. As I entered the bridge section, there were arrows like the speed boosters in Mario Kart and I was going about 70km/h, exactly what I’d guessed safe entry speed would be. No slide, in I turned… and turned and turned for another 42 seconds! After the bridge, it got steep and Clayton said we hit 90km/h before air braking for the last 2 corners. As we finished, light was barely entering the sky. We figured we weren’t too heated out so we drove up to get Nori and Clayton a run on this beast. It was just so cool that we had to get a closer look and spent the next hour walking around the base taking pictures. The final descent of the tour was over... but boy was it a great finale. We’d officially made it through 2 weeks of Japanese mountain roads without getting broken off! We celebrated with some more coffee and a picnic down by a beautiful waterfall near a wasabi farm. 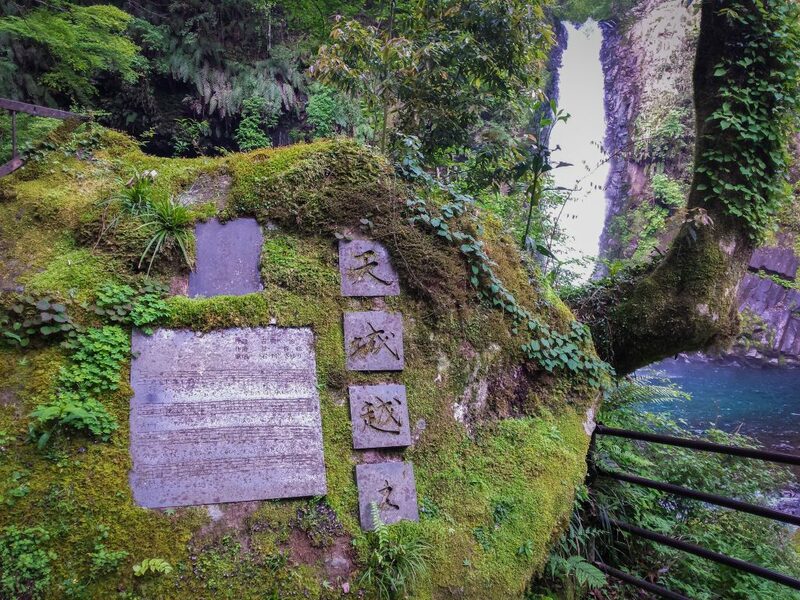 Close to the waterfall was this rock monument with music notes written on it and I wondered if this was inspiration for the temples in Zelda games. We had one night left in Tokyo before flying home so we went out for a huge seafood meal. 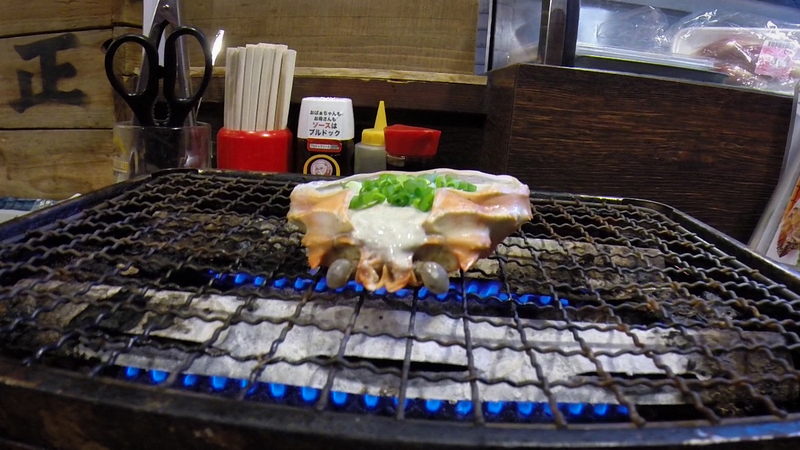 I ordered a plate of like 6 different kinds of sashimi and a crab dish served inside the shell and cooked on my own personal grill. We capped off the night with a 1am skate around a temple, hitting up banked driveways, and a few drinks at an Izakaya bar, going over the many highlights of our adventure. Japan is chock full of great roads and so few of them get skated. The opportunity for longboarding growth is huge and I suspect that one day, they’ll have a large, thriving community. I’d recommend this trip to anyone interested in the craziness of Japanese culture, long mountain bombs, and tight narrow passes. I hope you enjoyed following us on our trip, but more than that, I hope we've inspired some of you to plan a crazy adventure of your own. Every single day, people die regretting they didn't take that leap of faith and go live out that crazy dream. Most of us in the travelling longboarding community have normalized living this way but the reality is, the majority of people will never go for it. Don't settle for a quick trip to Paris before settling into your comfortable career, mortgage, and debt load for the rest of your life. Longboarders are naturally risk tolerant people and that can be a huge advantage over the average Joes so USE IT - and GO CHASE DOWN THAT CRAZY DREAM!